If it seems like this area was swimming in milk in its farming years, it was. And all that milk had to go somewhere. A number of the farmers who farmed the southern part of the township drove their milk to Roselle every day, day in and day out. The intent was to put it on the 8:30 milk train that ran from Roselle to Chicago. A few weeks ago an article that was published as part of Roselle’s 75th anniversary came into my hands from a former resident of Schaumburg Township. It is an account of the milk train written by Earl Crandall, who served as the Roselle station agent for 30 years, beginning in 1921. The article appears here just as it was written. For more than a century, Roselle Road through Schaumburg and Bloomindale Townships was one of the main milk and cheese pipelines into Chicago. In the 1920s this rolling prairie section was one of the dairy centers between Chicago and Elgin. Schaumburg Township farmers brought their milk and cream to collecting and processing point along Roselle Road. From those points dairy products – fluid milk, butter, and cheese – were transported down the road to the Village of Roselle and the Milwaukee Railroad from which a “milk train” made a daily round trip between Elgin and Chicago. In addition a considerable number of farmers brought their fresh milk directly to the train in Roselle and were direct shippers into the city. Being Roselle station agent in this period was the most important job in Roselle measure in terms of area and number of people served. I took over the Roselle station job in 1921 and handled it for 30 years. During my first two decades as railroad agent, practically this entire commerce passed through my office. One of my sharpest recollections was having to make out the shipment papers for all those German farmers in Schaumburg Township. I*t took me a long time to learn to spell those German names, such as Springingsgoth (sic). During these years there were commuter trains through Roselle at 5:15 and 6:30 in the morning. Then the milk train came at 8:30. We had as many as 25 farmers from Schaumburg and Bloomingdale Townships, who brought their cans of milk each morning and left them on one of two platforms we had at the station. The crew on the milk train would handle the transfer of the cans from the loading platform to the train. The milk train came back at 4 in the afternoon and unloaded the empty milk cans so the farmers could pick them up the next morning. This shows how times have changed. It’s a good thing the farmers aren’t doing that now. There wouldn’t be any cans there in the morning. But the farmers were only one means of moving milk from Schaumburg and Bloomingdale farms to Chicago. 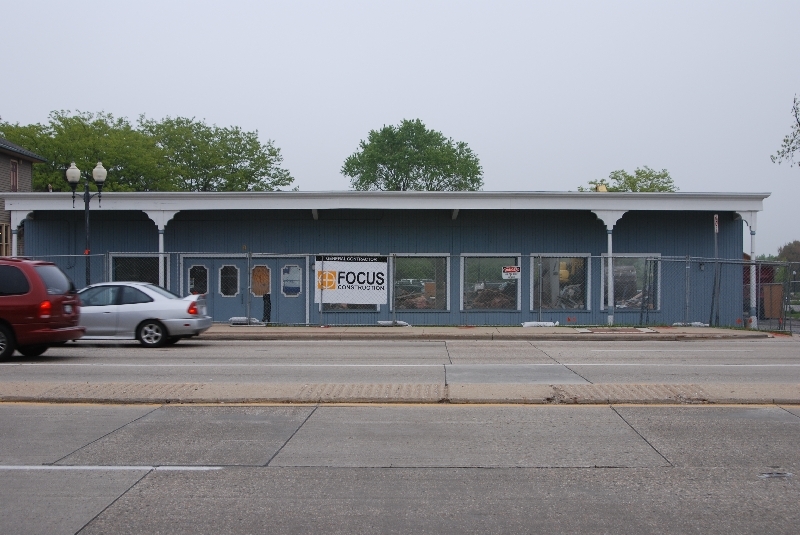 Nearly five miles north at the corner of Roselle and Higgins Roads (today this is in Hoffman Estates) stood the Nebel General Store and Creamery. Farmers as far north as Palatine would bring in cream to Nebel and the creamery would make it into butter and cheese. Most of the butter was sold back to farmers in the area. Several times a year I would get a shipment of 40 to 50 cases of cheese from up at Roselle and Higgins Roads. It was hauled by wagon to the Roselle station for shipment to Chicago. Times are always changing, and during my years as Roselle station agent, I witnessed change. Farmers and companies in the Schaumburg Township agricultural complex were constantly striving to deliver a better product to Chicago in order to get better prices and protect their market. This also demonstrated how important our area was in milk production for Chicago. At Schaumburg Center, situated at the intersection of Roselle and Schaumburg Roads, a milk plant was operated by Lake Zurich Milk Company. Its manager got a group of Schaumburg Township farmers interested in bringing their milk to Schaumburg Center so it could be cooled, put in large containers and moved by wagon down Roselle Road to the railroad siding at the Roselle station where an ice refrigerated car would be waiting. Those milk wagons were always pulled by mules. Each morning there was usually two wagon loads of milk delivered to that refrigerated car and sometimes there would be a third wagon load of milk. The “iced car” would be brought out from Elgin on one of those early morning trains and put on our Roselle siding. After the mule wagons had delivered their cargo, the car would be pulled into Chicago. 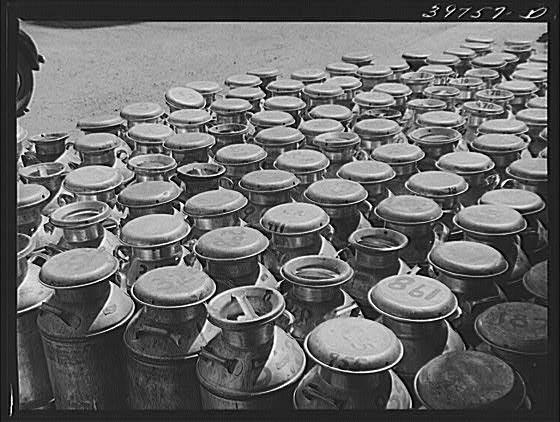 The Schaumburg Township area continued to be a major supplier of milk products to Chicago market until after World War II and into the 1950s. However, before the war, the mule wagon ceased hauling milk to Roselle as new milk handling methods, hinged to electrical refrigeration at the farm with truck transportation to the city, came into general use. 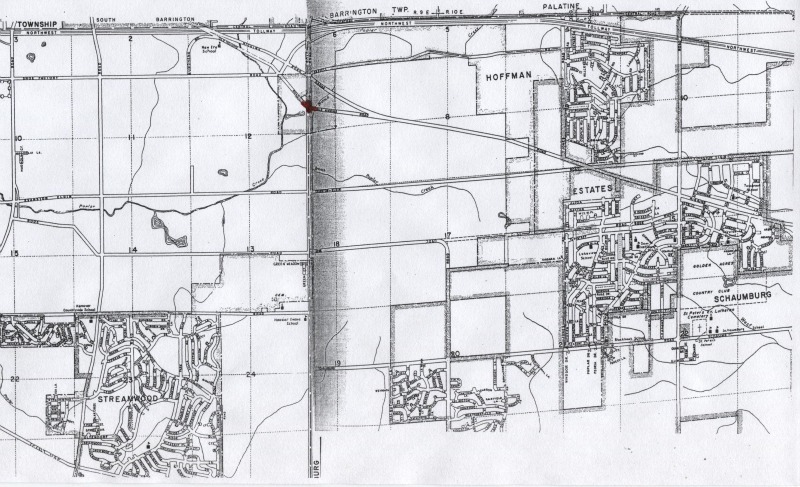 Then the urbanization of the Schaumburg area began and today 30,000 people live there. Today, the world’s largest indoor shopping center occupies the land that formerly supplied milk, butter and cheese to Chicago families. While Mr. Crandall has long since passed away, the details in the article are marvelous and fill in a gap of our history in a substantial way. A belated thank you to Mr. Crandall! When Higgins Road became a divided highway in 1938, the Cook County Herald referred to it as “a super highway.” And, for the time and the age, it was. As part of the construction though, the Highway Department made one small change. If you look at the map above (click on it for a larger view), you will see current day Higgins Road angling northwest out of the township. Below it is Old Higgins Road which ran roughly from Moon Lake Blvd along the St. Alexian Brothers Hospital property and crossed Barrington Road at the entrance to Cook County Forest Preserve’s Barrington Road Pond. After it crossed Barrington Road, it made a rather sharp 45 degree turn to the north, veering towards where it intersects with new Higgins Road near the tollway. In fact, the Poplar Creek Trail in the Forest Preserve essentially follows the path of Old Higgins Road. When that 45 degree turn was eliminated in 1938, the small intersection known as Buttermilk Corners–marked in red–began its slow fade into history. Unfortunately, business must not have been good because it wasn’t but a year later that the Cook County Herald reported in March that “the creamery at Buttermilk Corners is being torn down by the owner. Neighbors bought the brick and lumber which was of some use. H.V. Harz bought the wagon shed and lumber of the entire building.” This was an excellent bargain for Mr. Harz because his blacksmith shop was on the northwest corner of the intersection along Barrington Road. Despite the absence of the creamery, the name stuck until development began in earnest. The Harz blacksmith shop ensured the name as a reference point because of its longevity as well as when Bierman Implement opened across the road in the Quonset hut in the late 1930s. Farmers in the area used it in some of their classified ads in the Daily Herald of the 1950s when selling canning apples or Jerusalem artichokes! It was even given a bit of notoriety in the 1960s when an article in the September 5, 1967 issue of the Chicago Tribune entitled “Buttermilk Corners Life Sweet for Actor” discussed the residency of Clarence Hartzell, the voice of Uncle Fletcher and Constable Ben Withers of the Lum ‘n Abner radio show, on the farm of the current hospital property. Today, only those interested in the history of the area are familiar with Buttermilk Corners but it’s one of those neat country names that should have stuck—or been used by one of the local developers. 555 Buttermilk Corners has a nice ring to it, doesn’t it? If you’d like to see portions of Old Higgins Road, you can do so near Barrington Road, just south of TGI Fridays. If you look to the east, you will see the road and bridge that ran through the Steinmeyer property. Also, if you cross Barrington Road and follow the Poplar Creek Trail you can see the old roadbed where the Trail makes a curve and angles away from the Tollway. What do these two buildings, located near the intersection of Schaumburg and Roselle Roads, have in common? If you’ve been around the area long enough, you would be able to tell me that both were once the home of Lake-Cook Farm Supply. The one above was the first location. It was recently given to the village of Schaumburg in exchange for the Turret House on Schaumburg Road. The building on the right was later erected when the need to expand became apparent. It is currently the home of the Trickster Gallery. Lake-Cook Farm Supply came to the area on August 1, 1938. This location was the sixth in a local farmer cooperative that was started in Grayslake in 1927 “under the Farm Cooperative Act established in 1923.” (Daily Herald, November 10, 1983) According to the July 29, 1938 issue of the Cook County Herald, “the new service will offer a full line of feeds, seeds, and fertilizers in addition to petroleum products that the area received during eight years of patrolling by the Farm Supply.” They were even good enough to hold an introduction to their business at Schnute’s Tavern (the current Lou Malnati’s) in April of 1939. A movie was shown and a talk given to any interested parties who wished to attend. Accounts differ as to who was the first store manager. According to a July 29, 1938 issue of the Cook County Herald, Ed Bickford was named the manager of the store. Later accounts mention Ray Tagtmeier. In any case, one year later, Delbert Bullamore took over the reins and stayed until his retirement in 1979. He was joined by Ivan Reid in 1959 who also retired in 1979. Another employee, Bill Pohlman, delivered fuel oil for the early suburban residents of the township. After Bullamore and Reid’s retirement, the store was managed by Jim Coens or Doug Haas. Again, accounts differ. In 1975 the Schaumburg Planning Department approved construction of a large, two-story building to be built on the west side of Roselle Road across from the Buttery. According to an April 23, 1975 column from the Advisor, “Bullamore called attention to the widening of both Roselle and Schaumburg Roads, which he said is inevitable. He said the traffic along those roads was already too heavy for the two-lane patterns.” Built a year later in 1976, the business operated in their new, large space complete with big, wooden ceiling beams and a rustic decor. By this time, the store had evolved from supplying farmers to supplying suburbanites with lawn and garden equipment and supplies such as seeds, bulbs, nursery stock, tools, fertilizers, lawn spreaders, etc. 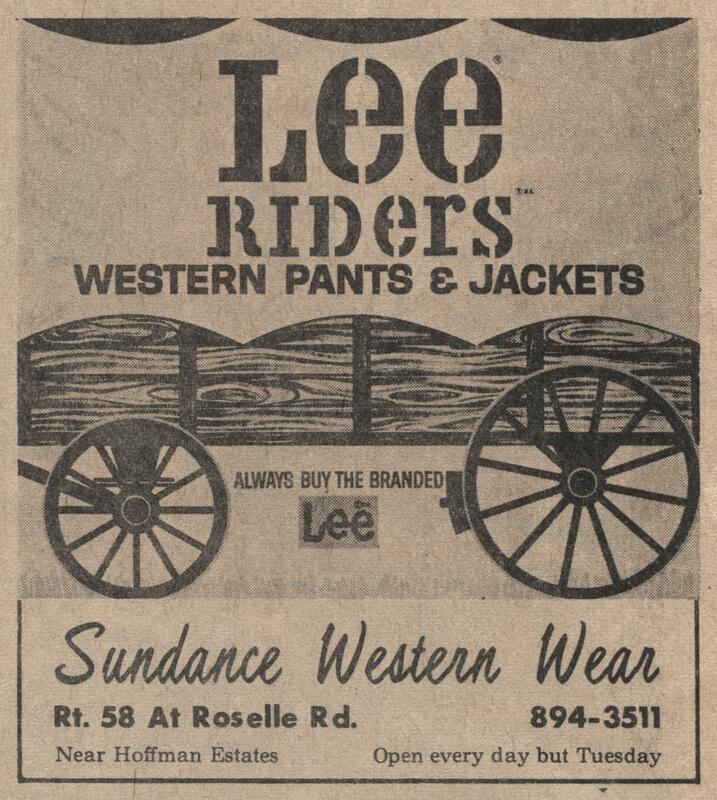 The store survived another six years until it was forced to close October 31, 1983 because of declining sales. Taking its place was Women’s Workout World followed by the Chicago Athenaeum Museum of Architecture and Design. It is now the location of the Trickster Gallery. Assistance for this posting came from those mentioned as well as Jack Netter of the Village of Schaumburg. The name of the game in early Schaumburg Township was milk, milk and more milk. It was obvious to the 1800s German farming contingent that the area was a perfect one-two punch for the production of milk. Not only was the prairie-like nature of the township a prime growing environment but the nearby, ready market for the valuable commodity was just too good to pass up. But, where to take the milk and cream once it was produced by your faithful herd? This is where a few industrious entrepreneurs stepped up and started their own, local creameries. One of these gentlemen was Fred Nebel who began a creamery/country store business called Nebel’s Corners that was located on the northwest corner of Higgins and Roselle Roads. Born in 1867 in Arlington Heights, Fred married Mary Scharringhausen of Schaumburg Township in 1889. Around 1898 Mr. Nebel purchased property that, essentially, ran between Golf and Higgins Road along Roselle Road and west towards where Golf and Higgins now cross. He began farming and then constructed the building that housed the creamery and store. 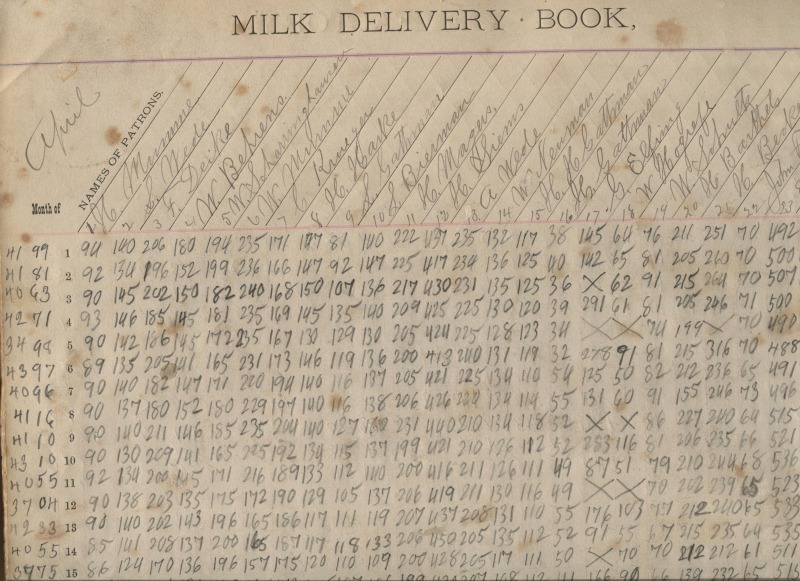 Because this was one of a few creameries in the township, it was necessary to solicit the business of nearby farmers who would not have far to go to haul their milk. In a rather unique business arrangement that was essentially barter-based, Mr. Nebel accepted the milk brought in by the farmers and allowed them to shop in his store as payment. At the end of the month, the balance would be totaled and if money was owed to the farmer, a check was written by Mr. Nebel. If the farmer owed Mr. Nebel they just kept the milk coming until the account was settled. In its heyday Nebel’s Corners accepted as much as 10,000 pounds (not gallons) of milk every morning. Just as there was no weekend for the farmers who milked the cows, Mr. Nebel worked a seven day week with the intake and processing of the milk. It was processed into mainly butter and, to a lesser extent, cheese, and sent off to be sold in the area markets. Over the years, according to Mr. Nebel’s grandson, he added other methods of garnering business. Gas pumps and a tavern that became part of the store were included on the property. Mr. Nebel and his sons continued to run the business after his wife passed away in the 1920s. It wasn’t until October 1931 when Mr. Nebel was killed in a car accident at the age of 64 that things changed. According to the grandson, the farmland was sold and the creamery part of the business was halted. 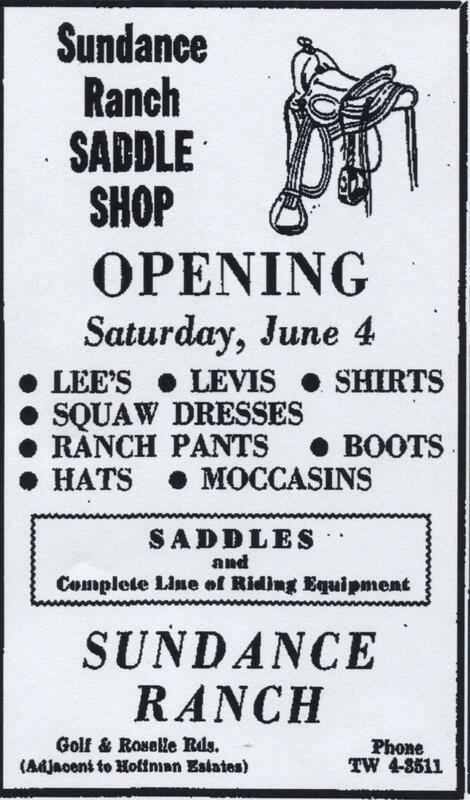 Mr. Nebel’s only son-in-law, William Heide, continued to operate the country store portion of the business until 1938. This pivotal year saw the State of Illinois’ Highway Department begin the process of buying property beginning at Route 53 and moving west along Higgins Road. The Mount Prospect Herald reported that Higgins Road was being converted into a “super highway.” Most property was purchased for $200 an acre but it was noted in the July 8, 1938 article that for the Nebel’s Corners property “a considerable higher price” was paid. Only the farmhouse was saved by moving it to the Fred Wille farm. Nebel’s Corners survived a lightning fire in1904, the death of its owner in 1931 and the demise of its creamery business, but it couldn’t stop the roads from coming. That northwest corner seemed to be destined, though, for a convenience store. It is where Walgreens sits today. The photo displayed in this article is from the Milk Delivery Book of Fred Nebel that covers the time of October 1891 to July 1892. Research for this article came from the Mount Prospect Herald, DuPage County Register, Genesis of a Township by Marilyn Lind and an oral history with Mr. Nebel’s grandson available on the library’s Local History Digital Archive.